Inspired by the digital age, this durable timepiece from the Sync collection is unmistakeably Gucci. Bearing the iconic green and red racing stripe against the stylish black rubber strap and crown, this elegant watch also boasts a jet black sunburst dial finished with the interlocking 'GG' monogram, Swiss movement, date aperture and 50m water resistance. Italian fashion house Gucci create Swiss made watches that are renowned for quality and cutting-edge design. 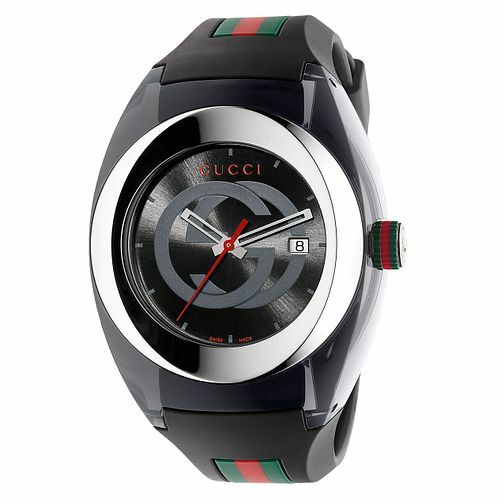 Gucci Sync men's black striped rubber strap watch is rated 5.0 out of 5 by 1. Rated 5 out of 5 by Anonymous from Lovely looking watch Bought as a present for me and looks great with a black suit for everyday wear. The strap and fastening stud are great, as I've had other watches with rubber straps that are too tight, but this one is excellent. A very good entry level watch.